Northwest Music Students: Please call 0400-608-177 for student prices. Bells 4 large nickel silver bells secure on heavy fabric for maximum chid safety and the most musical sound. Maraca Perfect for little hands, this small and durable maraca has a crisp clean sound that all little ones will love! Rhythm Sticks Pair made of beautiful hardwood with a natural finish. 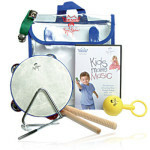 The shorter length of the sticks make it easy for young children to safely keep the beat and play rhythms! One stick is smooth and the other ribbed so you can tap or make those fun snoring sounds, duck quacks or frog noises! Tambourine: Rugged and built to last, this easy to use and fun to play tambourine has the highest quality sound and is sure to be a favourite for musicians of all ages. Triangle Tired of losing the hanger? Disappointed with a thud instead of a ring? This high quality triangle has a beautiful tone and you will enjoy the secure hanger that goes through the hole in the triangle so it stays with the triangle! Comes with an easy to grip handle striker. This is an instrument that professionals will appreciate and kids will love!